The schists form a group of medium-grade metamorphic rocks, chiefly notable for the preponderance of lamellar minerals such as micas, chlorite, talc, hornblende, graphite, and others. Quartz often occurs in drawn-out grains to such an extent that a particular form called quartz schist is produced. By definition, schist contains more than 50 percent platy and elongated minerals, often finely interleaved with quartz and feldspar. Schists are named for their prominent or perhaps unusual mineral constituents, such as garnet schist, tourmaline schist, glaucophane schist, and so forth. 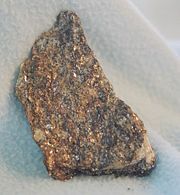 The individual mineral grains in schist, drawn out into flaky scales by heat and pressure, can be seen by the naked eye. Schist is characteristically foliated, meaning the individual mineral grains split off easily into flakes or slabs. The characteristic flaky texture of schist gives rise to the adjective "schistose." Schists have often been used in the construction of houses, including foundations and walls. Decorative rock walls on many houses in the New York City area consist of a schist called "Yonkers Stone." Manhattan schist, from southeastern New York. The term schist is derived from the Greek word that means "to split." It refers to the ease with which schists can be split along the plane in which the platy minerals lie. Most schists have in all probability been derived from clays and muds that have passed through a series of metamorphic processes involving the production of shales, slates, and phyllites as intermediate steps. Certain schists have been derived from fine-grained igneous rocks such as basalts and tuffs. Most schists are mica schists, but graphite and chlorite schists are also common. During metamorphism, rocks that were originally sedimentary and those that were igneous are converted into schists and gneisses. Rocks of similar original composition may be very difficult to distinguish from one another, if the metamorphism has been great. For example, a quartz-porphyry and a fine-grained feldspathic sandstone may both be converted into a gray or pink mica-schist. Usually, however, one can distinguish between sedimentary and igneous schists and gneisses. Often, the metamorphism is progressive, and if the whole district occupied by these rocks be investigated for traces of bedding, of clastic structure, unconformability or other evidence may be obtained revealing a group of altered sediments. In other cases, intrusive junctions, chilled edges, contact alteration, or porphyritic structure may prove that a metamorphic gneiss was originally an igneous rock. The last appeal is often to the chemistry of the rocks, as certain rock types occur only as sediments, while others are found only among igneous masses. However advanced the metamorphism may be, it rarely modifies the chemical composition of the mass very greatly. Such rocks—such as limestones, calc-schists, dolomites, quartzites and aluminous shales—have very definite chemical characteristics that distinguish them even when completely recrystallized. The schists and gneisses are classified according to the minerals they consist of, and this depends mainly on their chemical composition. There are, for example, a group of metamorphic limestones, marbles, calc-shists and cipolins, with crystalline dolomites; many of these contain silicate minerals such as mica, tremolite, diopside, scapolite, quartz and feldspar. They are derived from calcareous sediments of different degrees of purity. A separate group is rich in quartz (quartzites, quartz schists and quartzone gneisses), with variable amounts of white and black mica, garnet, feldspar, zoisite and hornblende. These were once sandstones and arenaceous rocks. The graphitic schists may represent sediments once containing coaly matter or plant remains. There are also schistose ironstones (hematite-schists), but metamorphic beds of salt or gypsum are uncommon. Schists of igneous origin include the silky calc-schists, the foliated serpentines (once ultramafic masses rich in olivine), and the white mica-schists, porphyroids and banded halleflintas, which have been derived from rhyolites, quartz-porphyries and acid tuffs. The majority of mica-schists are altered clays and shales, and pass into the normal sedimentary rocks through various types of phyllite and mica-slates. They are among the most common metamorphic rocks. Some of them are graphitic, and others, calcareous. The diversity in appearance and composition is very great, but they form a well-defined group not difficult to recognize, from the abundance of black and white micas and their thin, foliated, schistose character. A special subgroup consists of the andalusite-, staurolite-, kyanite-, and sillimanite-schists, together with the cordierite-gneisses. They usually appear in the vicinity of gneissose granites and have presumably been affected by contact alteration. The more coarsely foliated gneisses are almost as frequent as the mica-schists, and present a great variety of types differing in composition and appearance. They contain quartz, one or more varieties of feldspar, and usually mica, hornblende or augite, often garnet, iron oxides, and so forth. Hence, in composition they resemble granite, differing principally in their foliated structure. Many of them have "augen" or large elliptical crystals, mostly feldspar but sometimes quartz, which are the crushed remains of porphyritic minerals. Most of these augen gneisses are metamorphic granites, but sometimes a conglomerate bed simulates a gneiss of this kind rather closely. There are other gneisses, derived from feldspathic sandstones, grits, arkoses, and sediments of that type. They contain mostly biotite and muscovite. The hornblende and pyroxene gneisses are usually igneous rocks similar in composition to the hornblende-granites and quartz-diorites. The metamorphic forms of dolerite, basalt, and mafic igneous rocks generally have a distinctive facies, as their pyroxene and olivine are replaced by dark green hornblende, with often epidote, garnet and biotite. These rocks have a well-developed foliation, as the prismatic hornblendes lie side by side in parallel arrangement. The majority of amphibolites, hornblende-schists, foliated epidiorites and green schists belong to this group. Where they are least altered, they pass through chloritic schists into sheared diabases, flaser gabbros and other rocks in which remains of the original igneous minerals and structures occur in greater or less profusion. Schists have been frequently used in building houses or walls, as many are quite strong and durable. However, many foundation problems with buildings both large and small are due to decay of the schist or failure of the mortar. This in turn lets water into the joints, thus weakening the schist further. Most of the building foundations built in the 1920s and '30s in the New York City area used schist. Decorative rock walls on houses in the area also used a schist called "Yonkers Stone," which is no longer available. This schist was particularly hard and its color was fairly consistent. This page was last modified on 4 April 2008, at 00:57.